My beachcombing began the day these pictures were taken. I was 25 at the time and staying for a couple of weeks with student mates who had digs in Wapping, London. Then one day I saw, coming out of Metropolitan Wharf and walking down Wapping High Street, these exotic naked painted people. I followed them down the alleyway that leads to Wapping beach, chatted, and found out that they were part of a movement dubbed the Neo-Naturists. They had come down for the opening of an art show in one of the huge studios that artists used in the Wharf during the 'Eighties. These confident naked people had come down to the beach (well I call it a beach, it was made up of rocks bound with stinky mud) which was deserted at low tide and acted as a big playground for both the kids and the adults. We looked for broken clay pipes, of which there were plenty, and picked up some coins and found a discarded shopping trolley (I'm not the painted guy, I'm wearing the green pyjamas and the beard). It dawned on me, slowly, that here was London's history laid out before us. In bits and pieces admittedly, but damn exciting nevertheless. No one had picked up these pipe heads for more than a century, maybe two or three centuries even. And what about the location? Here we were in the heart of London and there was no one else around! The smell of the Thames, the sense of the forbidden, the slight danger (sometimes big danger, but more of that later) and all these treasures waiting to be found. This was so strange and new that I had to do more, learn more and become at one with the Thames for a while. I would understand that the Thames is fiercely tidal producing massively different levels of water. There are two tides a day taking approximately five hours to come in and a little over seven hours to go out. Near to the new and full moons (about every two weeks) there are spring tides when there is a rise and fall between low tide and high tide of up to 8 metres or 26 feet! It is so huge because the Thames in central London has been squeezed into a narrow channel by building work over centuries. Imagine that in Roman times the river's edge would be where Covent Garden is now, that's where the port was in those days. In the intervening two thousand years the city of London has pushed the Thames back around 100 metres with the final push (to date) being the architect Sir Joseph Bazelgette's construction of the Victorian sewers that created a new embankment and a new tall border for the Thames. The activity that's taken place over these millennia makes it one of the richest archaeological sites in the UK. When I returned to London in the early 2000s I endeavoured to spend my weekends by this river. 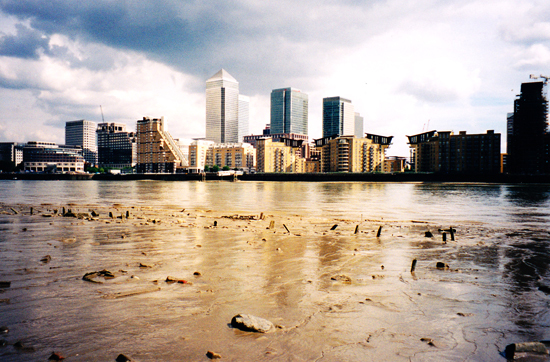 I would check out the Thames' tides a month in advance and choose the ones that would be low early in the morning. Then it was a seven mile drive from Muswell Hill and at 5 or 6 am I'd have a clear run down to the Thames. It's such a kick driving through central London with no one else around! The only things to slow your progress are traffic lights and clubbers meandering home. It would take me 30 minutes max, whereas on the way back, when the world was awake and filling the roads again it might take 90. Each time I went to the beach I'd look for a new place to search. I'd work my way along the north or south shoreline and have to find a new place to park. But that was good too. I was learning about the local geography and the 21st century London neighbourhoods of Rotherhithe, Stepney, Limehouse, Bermondsey, wherever. And then, once parked, I'd look for a ladder or set of stairs to get me down to the river. Some of the ladders were particularly rickety and the drop was a good 20 metres sometimes, so the sense of adventure started the moment I climbed over a wall, began the descent and breathed in the distinctive odour of old father Thames. 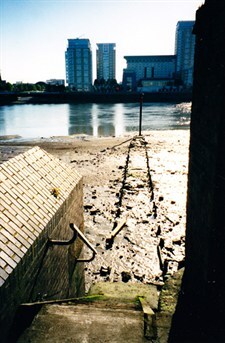 The picture alongside is set of stairs in Rotherhithe on the south side of the river. 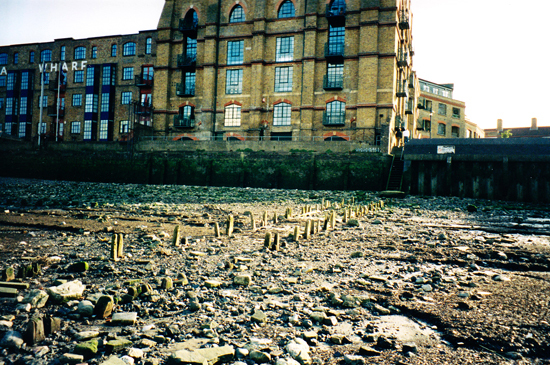 You can see what was once a walkway that led to the staging post for the Limehouse ferry that in the 19th century took people across that stretch of the river. In fact in the next picture below you'll see the wooden walkway feet which have just about rotted away. The building behind is Columbia Wharf built in the 1860s and used to store grain. It was still in use as a warehouse until the 1970s when it stored tea, coffee, cocoa and dried fruits. Now it has been taken over by the Hilton Group and been fitted out for flats and housing, retaining the name Columbia Wharf. A two bedroom flat with a balcony overlooking the Thames will set you back a quarter of a million which is quite reasonable, no? And then if you walk down to the edge of the muddy shoreline and look east across the oxbow bend of the Thames, you see this great view of the Isle of Dogs opposite.